I recently attended the 2017 Toronto Regional Conference hosted by the Association for the Advancement of Restorative Medicine, and all I can say is that the Doctors, both Allopathic and Naturopathic, who have found themselves on the cutting edge of the exciting field thyroid health are at odds with the conventional and established methods of treating this chronic illness. If you have personally been diagnosed with a thyroid illness like Hypothyroidism, Hashimotos Thyroiditis, Graves Disease, or Hyperthyroidism, what you may have been told is that you get to keep your condition forever. If you can imagine having a bad house guest who then decides they are never leaving, most health professionals will tell you to expect that your thyroid condition is going to stick around forever and there’s nothing you can do but manage the symptoms. What you need to know is that there is more to the story, and, as with any approach that hasn’t yet found its way into your average doctor’s office, if you wish to get better, and address the root cause of your illness instead of your symptoms, you’ll have to do your own research and advocate for yourself. You’ll want to work with a practitioner who is knowledgeable in thyroid health, and is also, most importantly, on the same page with you in terms of their approach to treatment. If you’ve been to more than one practitioner in your quest to figure out what the heck is going on with your thyroid, you’ll have noticed that there is a serious difference of opinion between practitioners about how to diagnose and treat thyroid disorders. Most medical doctors will reluctantly agree to test your TSH and Free T4 if you request thyroid testing (although even that can require some cajoling), however if you are fortunate enough to find a functional practitioner who has specialized in treating thyroid conditions, you’ll soon discover that there are a number of other tests that are considered to be standard from their perspective. In addition to your TSH and Free T4, a funcitonal practitioner will request to have your Free T3, Reverse T3, and your thyroid antibodies (thyroid peroxidase & thyroglobulin) tested as well. Some practitioners won’t stop there and will also test your levels of a number of vitamins and minerals including your B12, Selenium, Ferritin (Iron), and Iodine levels to name a few. However even that degree of testing is not considered to be a complete work up by experienced practitioners in the field who have worked with thyroid patients over the years. For instance, Dr. David Brownstein and Dr. Denis Wilson, two physicians who have specialized in caring for patients with thyroid disorders, both stress the importance of conducting a full work up on each patient because, and they both stressed this heavily, you can have normal results on a blood test and still have a thyroid issue. In addition to blood work, an experienced practitioner will do a physical exam and look for physical clues of a potential thyroid issue. This can include: having puffy eyelids, puffiness in your face, thinning eyebrows, thinning hair on your head, and a number of other physical signs. All of these attributes will be taken into consideration by an experienced practitioner, but it doesn’t end there. A full work up includes a detailed case history where your practitioner pays attention to related symptoms that could point to thyroid issues, for instance: cold hands and feet, an inability to concentrate (i.e. brain fog), and even hypertension to name a few. Remember a long long time ago when your doctor used to look at you when you came in for an appointment? When your doctor examined your actual body? When she would ask you how you felt, test your reflexes, and base your diagnosis and treatment, at least in part, on how you physically presented to her? If I learned anything from the Restorative Medicine Conference, it’s that experienced practitioners are paying attention to how you look and feel, and are using that information to inform any possible diagnosis and treatment of your thyroid disorder. Experienced practitioners know that it is possible for you to have normal looking blood work and still have a thyroid issue. If your test results look normal but you still have symptoms (physical or otherwise) that point to a possible thyroid issue, an old fashioned thermometer can give an experienced practitioner a better sense of what’s actually happening with your thyroid than just relying on your blood tests. As a Fertility Awareness Educator I am intimately aware of the relationship between your temperature and your metabolism. Whenever I work with someone who is delving into the nuances of charting her cycles, her temperatures are right there front and center, and that makes it easy to see if a thyroid issue could possibly be at play. In case you’re not too sure what your basal body temperature (BBT) is, it’s your resting body temperature – what you would measure first thing in the morning before you jump out of bed and start your day. Your resting body temperature is a real time measure of your metabolism. To be honest, it is the easiest, quickest, and most reliable way to measure your metabolic function, and guess what? Your metabolism is directly related to how well your thyroid is functioning. If you have normal blood tests, but you still have symptoms of low thyroid, and your body temperature is lower than normal, that is physical proof that your metabolism is low, and a strong indication that you may have a thyroid issue. This brings me to another important point. I’m going to take a moment to comment on the incredible state of disconnection we have found ourselves in in our modern day culture. If you take a moment to think about it, how is it possible that a piece of paper with numbers on it could have more weight than how you actually feel? Does that even make sense? Have we lost our minds? If you feel sluggish, you can’t really remember anything for more than 10 minutes at a time, you’re super sensitive to cold because your body temperature is too low, and your menstrual cycle chart is showing multiple markers for thyroid dysfunction and low hormone levels, then how can your doctor look at you and tell you that you’re completely fine because your tests read normally? The reason I wrote this post is empower you with the knowledge that there are multiple measures of a possible thyroid condition, with lab testing being an important part of the diagnostic process, but definitely not the only measure. As I’ve outlined here, there are a number of other diagnostic measures, but what I want you to take away is that how you feel is even more important than a test. Just remember that after your practitioner declares that everything is normal, as you walk out of her office, you take your body with you wherever you go. If you’re still not feeling well, nothing has really changed except your level of aggravation. I don’t know what it is with doctors and thyroid health in particular, but my experience has been that sending a client to the doctor for thyroid testing is often like sending a lamb to the slaughter house. It can really be that bad. What is it about requesting a Free T3, Reverse T3 and thyroid antibodies that sends traditionally trained allopathic physicians over the edge? To be honest, I’m not 100% sure, but if I had to guess I would say that it has something to do with the fact that you’re challenging their authority in an area that they honestly don’t have the most current and updated information about. Now I’m no doctor, and I definitely didn’t go to medical school, but that doesn’t mean that I don’t know more about current trends in thyroid treatment protocols than my doctor does. Yes I said it, and I believe it because I’ve experienced it. How is it even possible to go to two different practitioners and get completely different requisition forms for testing and completely different treatment protocols for the exact same issue? How is it possible that there is such a dramatic gap in the level of care that you receive from one practitioner to the next? Well, that is the question you should be asking yourself. Scientific research is happening every day in every area you can think of. Every single day there are hundreds if not thousands of new research studies in all areas of human health, and it is impossible for anyone to keep up with every advancement in every area. You know the phrase: Jack of all trades master of none? That is the reason why practitioners break off into specializations. To be truly good at something you have to study it in great depth, and you can’t study everything in great depth. There just aren’t enough years in our life span or hours in the day for any one person to master everything. If you have a thyroid issue, you’ll be much better served finding a practitioner who cares about the current trends in thyroid research, as well as current trends in diagnostic and treatment protocols. Someone who is aware that offering only a TSH test and a T4 test is not even close to an acceptable standard of care. My opinion here is that it isn’t worth wasting your time and energy arguing with anyone. If your doctor isn’t willing to order 5 simple blood tests for you, let alone do a full workup with respect to your thyroid, then she’s not the right doctor to help you with this particular issue. An important consideration is that if your doctor doesn’t want to order the tests, will she know how to interpret them and support you if they do show you have an issue? If the answer is no, it’s time to go shopping for a new practitioner. You need someone who is willing to help you, someone who cares if you get better. Someone whose goal isn’t to “get your TSH in the normal range,” but instead someone who wants to address the root cause, help you feel better, and actually work towards restoring your thyroid health back to optimal levels. There is a ridiculous amount of conflicting information about iodine and the role it plays in thyroid health. Some practitioners will say that iodine is not safe if your thyroid issue has an autoimmune component, and there is an overarching fear and hesitancy of practitioners to discuss iodine as an important part of your treatment protocol if you do have a thyroid issue. One thing you’ll want to consider is that your thyroid requires iodine to produce thyroid hormones. In fact, your thyroid hormones, T3 and T4 to be specific, are named for the number of iodine atoms that make up their molecular structure. Yes, T4 has 4 iodine atoms attached to it, and T3 has 3. There are times when it’s okay for us to use our common sense to solve problems, and this is one of them. Dr. Brownstein’s message comes through loud and clear in his work. Iodine deficiency is a significant factor in the thyroid equation whether there is an autoimmune component or not, however it is certainly not the only factor. Iodine alone won’t address the dietary and lifestyle factors, or the additional nutrient deficiencies that together form the complete picture when it comes to addressing thyroid dysfunction. However, given how integral iodine is to thyroid health and thyroid hormone production it is arguably negligent to ignore it completely. The last, and most hopeful piece of information that I want you to take away from this article is that it is actually possible to heal. It is possible to find a treatment protocol that results in you feeling better, and in some cases, not having to depend on thyroid medication for the rest of your life. It’s not always the case, but it is important to know that some people are able to heal their thyroid disorders. Dr. Brownstein has patients who have eliminated their thyroid antibodies by addressing iodine deficiency as part of his treatment protocols. Dr. Wilson has helped patients improve their thyroid function (and have a sustained increase in body temperature) through careful administration of T3 only medication. Improvements that continue even after his patients stop taking their medication. It is also important to know that there is more than one way to skin a cat. There is no one magical treatment modality for thyroid disorders. If someone tells you that “your TSH is elevated and your only option is to go on Synthroid,” see numbers 3 and 4 above, and find someone who is invested in helping you get to the root cause of your thyroid disorders, not helping you mask the symptoms of the underlying disease process. The path to healing isn’t always easy, but it is definitely worth it, and the one thing I know for sure, is that you won’t regret delving deeper into this and persisting until you actually feel better and begin to see improvements in your health, your menstrual cycles, and your fertility. Now I want to hear from you! 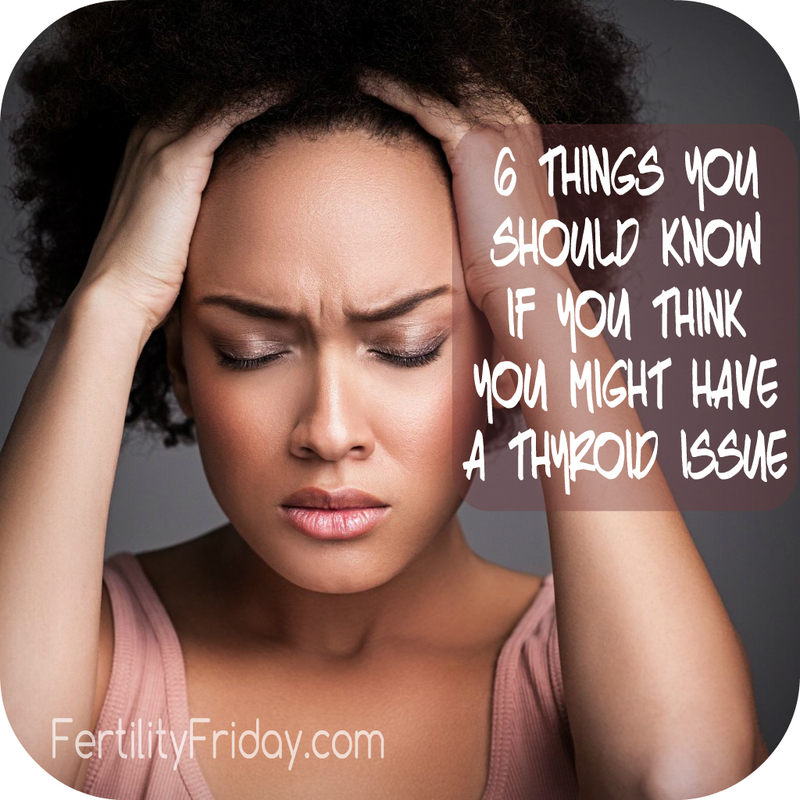 Have you been diagnosed with a thyroid disorder? Were you able to find a practitioner that was willing to do a complete work up (complete with a full thyroid panel)? Do you find yourself having symptoms, but “normal” lab results? Please share your experiences in the comments below! Hi Lyse, I hope you’re able to find a practitioner who is willing to support you. In the mean time the book I mention above: Overcoming Thyroid Disorders my prove to be life changing. So glad you liked the article! So timely for me! It is exhausting to have to be constantly advocating for yourself, as a doula I know you always have to advocate for ourself. What would you recommend as a first or most comprehensive resource as I appear to be starting in my thyroid journey. So glad you found the post helpful! A great place to start is David Brownstein’s book: Overcoming Thyroid Disorders. Second to that is finding a practitioner who specializes in thyroid health in a holistic/funcitonal way. My first pregnancy visit, my NP asked about my hypothyroidism. I explained I was never diagnosed and outlined what I went through. She said she had a friend in Germany who had symptoms also- and her doc over there suggested iodine. She also got pregnant a few months later. She was fascinated about my story and was interested in checking out my labs more in depth. It was nice to finally feel validated on my experience.